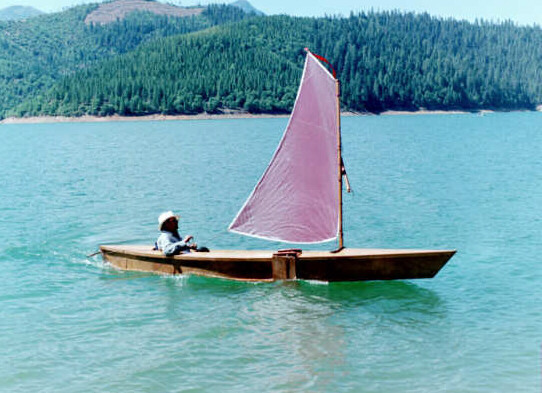 Chien Juan: ÅÅThey say a Bolger pirogue is tender, but this sixteen-footer seems stable enough. Judging from the plans, the hull is put together just about like the light schooner, with fewer bulkheads and no centerboard or motor-mount complications. It takes four sheets of 1/4" ply and a few boards. Plans are probably still available from CSD. I made the chines and gunwales by ripping 1" x 4" fir boards, and the skeg and mast partner and step with mahogany left over from a West African shipping box. Changed Bolger's plan by making the cross-piece for the rudder out of 3/4" copper pipe instead of 2" x2" fir. The leeboard is epoxied to a piece of right-angled 1/2" stainless steel rod that lets you mount and dismount it and spin it out of the water while afloat. Hogin Sails of Alameda, California made the spritsail-- they had a neat home-made lapstrake cockleshell boat in the loft with a spritsail on it, with a bowed laminated boom sprit and a batten at the top like a gaff. They seem to know about rectangular sails. In the picture one of the lashings was too tight, which doesn't do the sail justice. But the purple comes through nicely. The pirow rows nicely with outriggers, and paddles OK. It would be a good boat for a wide river with maybe a few fast places in it. My idea was the Amazon, but so far it's been the Sacramento River and Delta, and Trinity Lake. There's plenty of room for one person to sleep.